Clearly here in this world, for its protection, Thou do take birth, activity, name etc., by Thy power of Maayaa, comprising of the Gunaas and Vidyaa and Avidyaa. O Thou of wondeerful nature! O Home of liberation! Though formless, Thou do take on many forms. 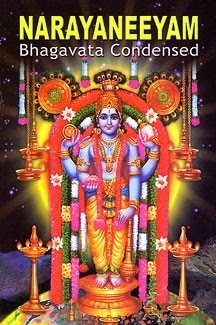 O Vishnu! Supreme Bliss Infinite! Salutations to Thee. Thy form is said to be, by the wise, of neither bird or animal or of a human being, a god or a demon, a woman or a man, nor is it substance, function, species or attribute, existent or non existent. By such negations by several Upanishads, what is left over, is with great difficulty and implied references made to be known as the Supreme Bliss that shines. To That Thee, salutations. Thou do reflect Thyself in Thy Maayaa, and project the Mahat (whole creation), Ahankaar (Ego), the five different Tanmaatraas (sound, touch,form,taste and smell), the group of five elements (fire,earth, space, air and water), and the senses and the mind etc., also. The whole universe is projected like a dream and the articles in the dream. Again withdrawing everything into Thyself with Thy power of Kaal (Time), like the totoise drawing in its legs, an intense darkness is produced. Uneffectedd by this darkness, Thou do shine. To That Thee salutations. O Lord! Thou being the only one cause of the universe, being in everything and concievable in everything are described as and are spoken of as the Primeval Sound, Karma, Atom, Time and so on. In Vedaant that reality alone is called Purusha, Supreme Being, Pure Conciousness and Aatma, and by whose mere glance causes Maayaa to project the universe with various modifications. O Lord Krishna! salutations to Thee. Avidyaa, ignorance, which cannot be described as existent or non existent or even both, projects the objective world, just as a rope is projected as a snake. When Avidyaa gets transformed into Vidyaa as a result of God's grace flowing like a stream, coupled with hearing of some statements of the scriptures, it becomes the axe which cuts the forest of the objective world. O Lord! to That Thee salutations. Even when this world is seen as existing, it is Thy nondual self in Reality, just as there is gold in all ornaments and clay in all earthen pots and vessels. Just as for a dreamer, on waking up, darkness vanishes, a worn out rope is seen clearly. When knowldege dawns, it becomes crystal clear through the total sublation of the objective world into Thyself, their substratum. To That Krishna! salutations. Fearing whom the sun rises, the fire burns, the wind blows, and Brahmaa and others bring appropriate offerings (perform their functions) at the proper time. By whom alone they are raised to their places at the beginning of creation and later removed. To That Controller of the world! To Thee Krishna! we make prostrations. Thou do manifest the three worlds comprising of the three gunas. Thou alone are the meaning of the word made up of the three letters (AUM). Thou are one manifestation as the Trinity - Brahmaa Vishnu and Shiva. Thy true nature is sung of by the three Vedas. Thou as pure consciousness are aware of the three states of waking dream and sleep. Thou do take incarnation in the three Yugas, and cover the whole world in three strides. In the three periods of time - past present and future, Thou are unchanged. I always worship Thee by the means of three yogas - Gyaan, Bhakti and Karma. Eternal, pure, ever awake, shines Thy Being, ever free, desireless, beyond opposites, changeless, the source of manifesting and holding of all values and good qualities, causeless, taintless from ignorance, eminating limitless glory, latent in the hearts of the non attached, luminous with the light of concentrated Supreme Bliss. O Vishnu! Thy irreversible wheel of time with its twelve spokes(months),and 360 teeth (days), whirling with ferocious speed, cutting the universe every moment , and running forward, may it not torment me, whose only refuge is at Thy feet. O Ocean of Compassion! O Lord of Guruvaayur! save me from my hosts of ailments.